I read this article and found it very interesting, thought it might be something for you. The article is called Mobile Heartbeat Announces Integration with AirStrip One App and is located at https://hitconsultant.net/2014/10/14/mobile-heartbeat-announces-integration-with-airstrip-one-app/. Mobile Heartbeat, a provider of smartphone clinical communications, today announced a technology partnership with AirStrip, the leading provider of mHealth solutions that drive clinical transformation through mobility and interoperability. The companies will integrate AirStrip’s proprietary methodology for accessing critical patient data into the Mobile Heartbeat clinical communications platform to provide expanded mobile capabilities to patient care teams. The Mobile Heartbeat CURE (Clinical Urgent Response) smartphone application will integrate with AirStrip ONE® to provide broader clinical context including EMR data and waveform data from cardiac and neonatal monitors in near real time. HCA, which has 164 hospitals and is one of the leading providers of healthcare services, is an investor in both AirStrip and Mobile Heartbeat through HCA’s Health Insight Capital subsidiary. The partnership will also support HCA’s care coordination initiatives in ways that improve quality and efficiency while reducing costs. Mobile Heartbeat CURE provides patient care teams, including nurses, physicians and technicians, with secure, single smartphone access to all clinical communications, pertinent patient information and lab data. 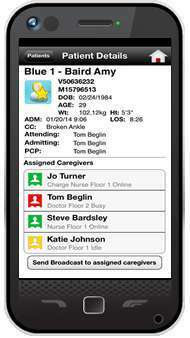 Care team members have a choice of using their own smartphone (BYOD) or sharing hospital-supplied devices. With Mobile Heartbeat CURE, care team members know who else is on the team for each patient and can view the availability and location of other team members at all times. Mobile Heartbeat CURE enables efficient delivery of clinical data and communications to users on-site, off-site and at multiple locations to ensure timely patient care decisions and response. Hospitals save time and reduce costs as well as improve patient care when using MH-CURE.